On Earth Day, April 22, the U.S. Environmental Protection Agency (EPA) announced the winners of its Campus RainWorks Challenge, a design competition to engage college and university students in reinventing water infrastructure. Student teams proposed innovative green infrastructure designs to reduce stormwater pollution and develop sustainable communities. This year, more than 500 college students from 64 teams in 23 states submitted entries in two design categories, and four winners were chosen. The University of Illinois at Chicago won first place in the master plan category, and the University of Maryland, College Park placed first in the demonstration project category. Second place winners included the University of Illinois at Urbana-Champaign in the master plan category and Queens College, City University of New York in the demonstration project category. The judging team included five Water Environment Federation (WEF) volunteers, in addition to volunteers from the American Society of Civil Engineers and the American Society of Landscape Engineers. “Judging by the quality of the proposals submitted by these student teams, I am extremely optimistic about the future of the stormwater industry,” wrote Scott Turner, director of planning at Nitsch Engineering, in a WEF blog about his experience judging the competition. A map by the University of Illinois at Chicago showing existing conditions at the team’s planning site. The University of Illinois at Chicago team included seven students from civil and materials engineering, urban planning and policy, and earth and environmental sciences. The students won first place for an integrated green infrastructure plan to reduce runoff by 25% on the east side of campus. 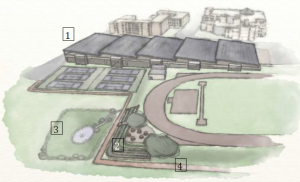 The plan involves a four-phased approach: first, to invest in demonstration projects; second, to expand successful projects based on monitoring data; third, to integrated green infrastructure projects and planning into campus management; and fourth, to tie those projects with social and educational goals. A rendering by the University of Maryland showing the team’s proposed design. 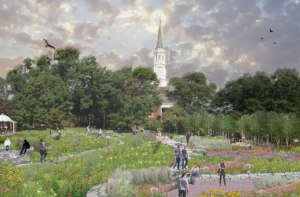 The University of Maryland’s design centers on a 3-ha (7-ac) site that will capture and treat stormwater from adjacent impervious surfaces by replacing traditional lawn cover with a meadow landscape. The site will include bioretention and bioswales to treat 100% of a one-year storm event. A rendering by the University of Illinois at Urbana-Champaign showing the team’s proposed design. The Urbana-Champaign team included 12 students from environmental economics, civil engineering, architecture and landscape architecture. The students won second place for a plan to expand the current campus green infrastructure network to reduce stormwater runoff into the highly channelized Boneyard Creek by more than 35%. 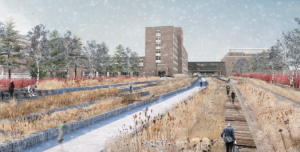 Additionally, the team proposes a transformation of the creek into a terraced, multifunctional landscape with native plantings, pollinator habitat, and recreational opportunities. A rendering by the Queens College, City University of New York showing the team’s proposed design. The Queens College team proposed the installation of a photovoltaic canopy and rainwater harvesting system over a campus parking garage. Runoff would be directed into vegetated terraces, a bioswale, and a retention pond. Designed to produce 1.4 gigawatt hours of electricity and capture 14.2 million L (3.75 million gal) of runoff annually, the project also would help reduce combined sewer overflows and serve as a teaching laboratory. EPA launched the Campus RainWorks Challenge in 2013 to help inspire the next generation of engineers, planners, and landscape architects to develop innovative green infrastructure systems. First-place teams receive a $2,000 cash award, and second-place teams receive $1,000. 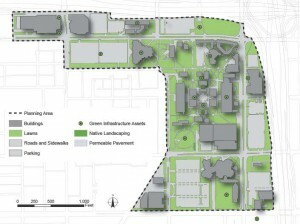 Additionally, each campus will receive funding for faculty research on green infrastructure. EPA plans to conduct the challenge again in fall 2015. Read more.